Home Write Quality Content Write Quality Content for blogger post? Write Quality Content for blogger post? Quality content is highly affecting in writing an article. 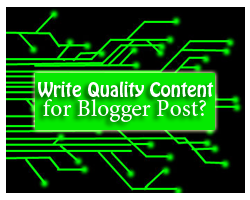 And every blogger wants to write a write high quality content for their blog/website. So if your (content) is not Quality definitely your blogging traffic stats are going down. What has Quality Content been? Select a unique and user helpful topic. Many topics are not searched at the search engines. Always write latest information in it which is more attractive for the user. Add pictures to post related which make post cool. Always choose that topic which is unique and poses high quality. Before write your post collect all information about your post content, you can easily collect your topical information, just you Search others website/blog on search engines and collect a lot of information about the topic then you start to post your writing.